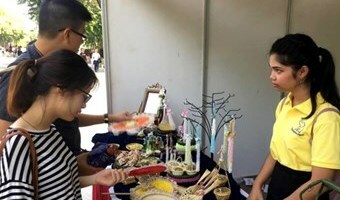 Accordingly, folk arts, circus performance and chess games will be held at Ly Thai To Monument, Ba Kieu Temple area and Dong Kinh Nghia Thuc Square. Diverse activities will take place at these areas on December 1-2 including the National Volunteer Festival, circus march and running programs at Ly Thai To Monument area, and AIDS prevention programs at the Hang Trong-Le Thai To crossroads. A digital technology and e-commerce week and the 2018 national green week will be held on December 7-9. Especially, from December 14-16, there will be the 2018 French Culture held by the French Embassy at Ly Thai To Monument area and art program to mark the New Year at Dong Kinh Nghia Thuc Square. On December 22-23, a cultural program titled “Amazing Thailand” will be held at Dong Kinh Nghia Thuc Square. On December 29-30, a vast array of activities to promote cultural and tourism of Dien Bien province and art performances to mark the New Year will be held at Ly Thai To Monument … [Read more...] about Hoan Kiem pedestrian streets expect diverse cultural, sports events in Dec.